In the desert, anything goes. 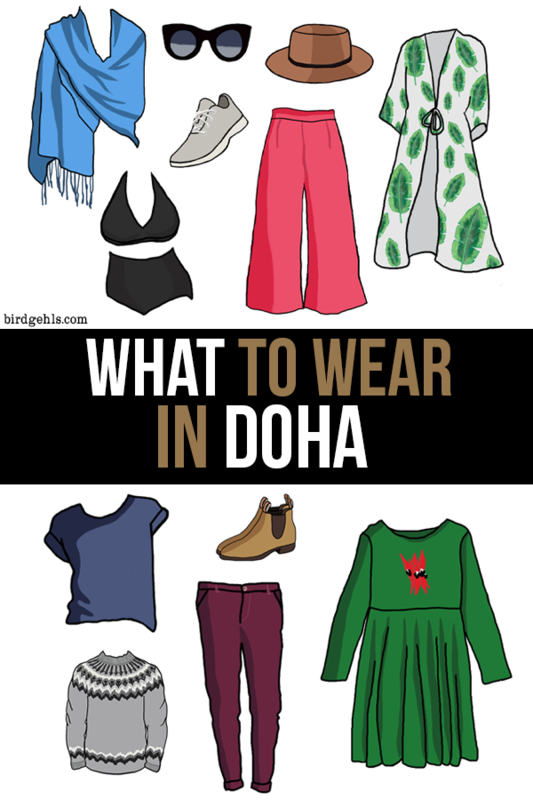 Qatar is a tricky country to pack for and it can be difficult to know what to wear in Doha. Not only is it as hot as hades at certain times of the year, Sharia Law (religious law following Islamic tradition) is expected to be adhered to. This doesn’t mean you have to wear an abaya (the essentially robe-like dress worn by some women of Muslim faith), or even cover your hair. However, if you are female, you are generally expected to keep your shoulders and down to your knees covered in clothing. You don’t have to and many Western expats do their own thing. However, it would certainly be the polite thing to do for most of the year. It’s rather more enforced during the month of Ramadan in this Islamic country. So, you’ll want to strike a balance. That is, packing clothing that will keep you cool and comfortable and allow you to dress respectfully in the country of Qatar. If you’re wondering if it’s safe to travel to Doha as a woman – yes it is, but read the linked post before you go. 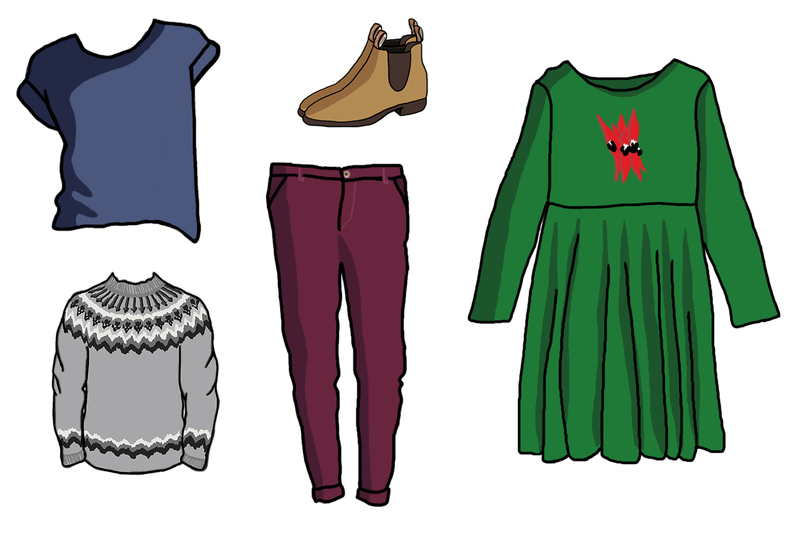 Here are some suggestions for what to wear in Doha – with illustrations! Doha can get darn hot during the summer months (it is a desert climate after all), with average highs of 43°C (90°F). It doesn’t rain either… it’s a hot, dry summer. You’d naturally be inclined to don as little clothing as possible, but two factors prevent this. The first is that Qatar is an Islamic country, so there are restrictions on what is deemed appropriate to wear in the company of other people. The second is that everywhere is air conditioned, to the point that you’re constantly stepping in between temperatures of 40-18°C. Unless you’re walking through the city or going on a day trip somewhere, the time you actually spend outside in the heat will be minimal. You’ll need to dress in a way that will work with the ever-changing temperature drops, so that you don’t get sick. Summer colds are definitely something worth avoiding. So, if you’re travelling to Doha in the warmer months, here are some things you should consider bringing along. A shawl or light scarf will be your best friend when travelling or living in Qatar. It’s an easy way to cover up when you feel you need it. 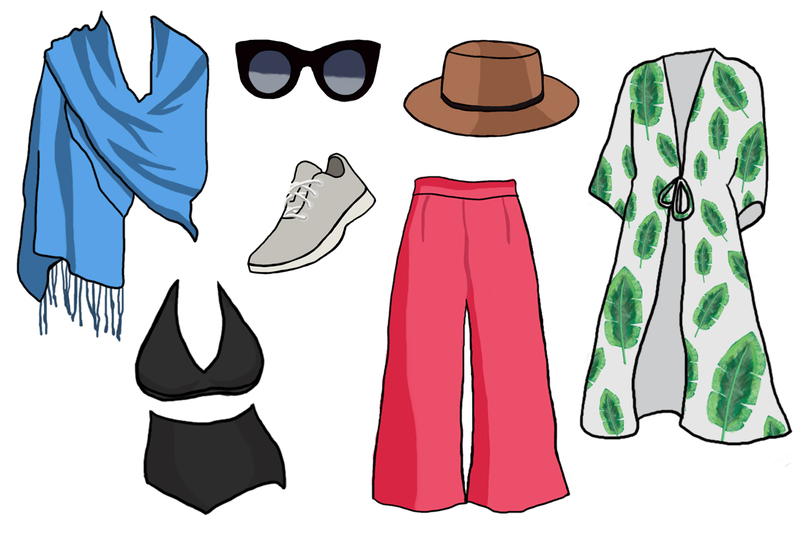 You can wear tank or singlet tops and throw a scarf or shawl over your shoulders. They’re lightweight and pretty – a nice addition to most outfits. If you arrive in Doha shawl-less, never fear – they’re sold within the Souq Waqif. Make sure you haggle your way to a price that’s fair for both you and the vendor. I find kimonos to be super elegant, particularly the long ones, with sleeves. Throw them over a tank top with jeans, or wear one with leggings underneath (preferably not of the see-through variety). Pair long skirts with blouses or t-shirts and if you’re prone to chub rub in the warmer months, wear a pair of skin-tight shorts underneath (shop here) or Bandalettes. 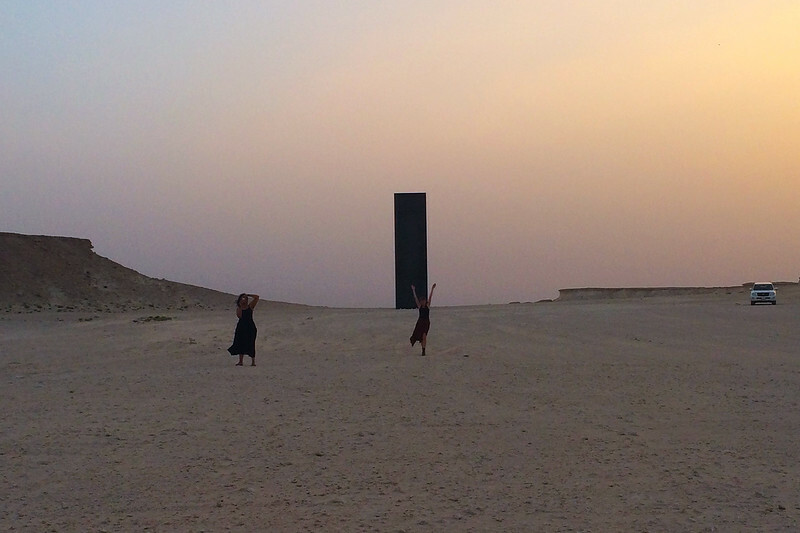 Maxi dresses will make a welcome addition to your Doha wardrobe. I look for cute ones with sleeves or buttons that gather at the waist. You can also wear them clubbing, which is favoured pastime of expats in Doha. As stated above, tank and singlet tops are fine to wear, as long as you cover your shoulders. A a sustainable traveller and fashion-lover, I’m a big fan of linen clothing. It’s a good textile to invest in as it’s breathable, comfortable, durable and ethically made. Something like this linen shirt and these trousers would be ideal. I pretty much lived in this outfit, when I lived in Doha. T-shirt dresses are so comfortable – look for ones made out of organic cotton. I also brought several pairs of leggings to wear under them, ankle or three quarter length. My favourites were a velvet pair covered with leopard spots. Rawr. I admittedly did wear shorts on a few occasions, when making day trips outside of Doha into the desert with other expats. I would not however, wear them when walking around the city. Donning a pair of culottes is a way to instantly look fashionable (in my opinion) – I like navy, black or mustard, worn with t-shirts. I’ve been pretty much living in a pair of tan Salt Water shoes, which I think would be perfect for a Doha summer. They don’t rub and are waterproof, so they don’t get the horrible sweat stains of many other leather sandals. My go-to summer sneakers are AllBirds, because they’re Kiwi, but swap out with whatever brand you wish, such as this one here. Basically, go for sneakers made out of lightweight material, so your feet can breathe. Don’t go anywhere without a hat in summer! Likewise, protect your eyes from harmful, UV rays. And your skin! I would wear at least SPF 30+ on your face and body – here’s a natural sunscreen that I like a lot. Look for a BB cream that has UV protection for an extra bit of coverage. A note on swimmers – you can wear whatever you want in private beaches and hotel pools (and at beaches outside of the city, where there is no one else about), but the one public beach in the city (within Katara Cultural Village) has the same rules regarding covering up. So, bring your bikini or one piece, but be careful where you wear it. And make sure you cover up from the lobby of your hotel to the beach (I find kaftans or a wrap dress to be perfect for this). Winter in Doha is a lot more palatable, with temperatures ranging around 22-30°C (50-70°F). It feels like spring would in many other countries. It may also rain on occasion, no more than 100 millimetres a year. However, it can come in the form of a deluge, even causing flooding at time. Here are some ideas of what to pack if you’re heading to Doha in the cooler months. Jeans are easy, nearly everyone has a pair in the wardrobe and they can be dressed up or down. Chinos I find to be perfect casual work wear. I’d bring a few tees to rotate, depending on how long you’re going (at least three). T-shirts fit all the criteria and if you buy them in organic cotton or linen, you’ll be comfortable on warmer days. Shop organic cotton t-shirts here! If you fancy dressing up a little, swap out the t-shirt for a blouse. Perfect for when the weather drops a little. It can get deceptively cold during a winter’s night in Doha, so pack a light jacket in order to combat this. Something like this would do the job and help on the odd occasions where it pours down rain in Doha. Along with sneakers, chuck some comfortable boots into your suitcase. My go-to are my Timberlands, which I’ve had for four years – they’ve served me well! If you fancy dressing up a bit, then a long-sleeve dress will do the job. Something like this which won’t hug your figure will be ideal. The dress code in hotels is a little more relaxed, you can essentially wear whatever you want (within reason). I regular worked out in my hotel’s gym and wore what I would at home – tight fitting lycra and shorts. I also wore my bikini or one piece to go swimming in the hotel pool. Many bars and clubs are part of the local hotels and the dress code is relaxed there too – although I was once nearly denied entry to a club for not wearing high heels (the feminist in me loved that). Just make sure you cover up on your journey to and from the premises. Hopefully this gives you some idea of what to wear in Doha. In short, feel free to stay fashionable – it will be heavily appreciated in Doha, but stay within the rules and you’ll be fine. Should you travel to Doha during Ramadan? Here’s an eco-friendly packing list for sustainable travellers.